Begin by identifying the area where the retractable screen will be mounted. SMALLEST width and height measurement. Best is to Mount in the Jamb area if you have thick enough moulding will also work. 1. Reversing width and height when measuring. 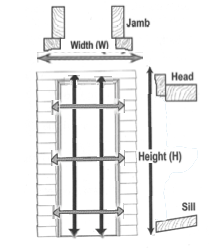 Width is the side-to-side measurement. Height is the top-to-bottom measurement. The width is always given before the height of the Door or window. For example, an order 48 x 72 would be manufactured 48 inches wide by 72 inches high. To avoid confusion, as you measure put a W next to width measurement and an H by the height measurement. Find out more in our How to Measure section. 2. Not checking the measurements in three places on both the width and height of the window. Use a ladder or stool to reach the top of high windows. Many windows are not square, so the width should be measured at the top, in the middle and at the bottom. Also check the height of the window in the middle and at both sides. When placing your order use the smallest size of the three measurements. 3 Not allowing for obstructions that will hamper the operation of the screen. The most common obstructions are inside the window frame are window cranks and handles. We can provide fold down window cranks for most windows. 4 Rounding off your measurements. When measuring for inside-mounted screens, don't round up or down, measure to the nearest 1/8 of an inch. we will make the appropriate deductions to allow the screen to be fitted inside or out side your window. 5 Ordering from someone else. Bravoscreens.com has the right products for you.